These high quality Rotary Table are made by using very high quality raw material which ensures hassle free work performance at its user end. 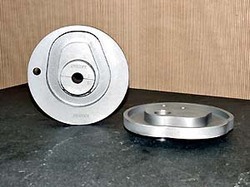 These Rotary Table are available in various features and dimensions. Clients can avail from us a superior quality range of Motion Control Systems that is manufactured using premium quality raw material and advanced technology. Our offered products are methodically examined by our skilled quality controllers on well-defined parameters. Pulse Equivalency Variable, electronic gear, numerator and optional denominator in the range from 1 to 65535. Memory space 32-64M oversized memory capacity for user program and no restriction to machining program. With the rich industry experience and knowledge, we are manufacturing and supplying a qualitative range of Rotary Indexing Tables that are used in special purpose machines. Developed using high grade raw material and advanced techniques, these are designed in accordance with the international quality standards. Camfield Engineers present superior quality Rotary Indexing Drives to our valuable clients. Our CNC Rotary Drives is manufactured as per the customized requirement of the valued clients its available in various range with unique quality. They are very durable and have long lasting functional life. Camfield Engineers are a renowned name, which is engaged in providing a comprehensive range of Automated Assembly Systems. Automated Assembly Systems is made by utilizing high grade components that are sourced from dependable vendors of the market. In addition to this, the quality controllers hired by us ensure to inspect the entire range strictly to ensure its tandem with the industry laid norms and standards. Looking for Pick And Place Automation Systems ?